Though news of the attack by the WannaCry virus triggered widespread alarm within Boeing and among airline customers during the day Wednesday, by evening the company was calling for calm. “We are on a call with just about every VP in Boeing,” VanderWel’s memo said. It took until late Wednesday afternoon before Boeing issued a statement dialing back the fears. “It took some time for us to go to our South Carolina operations, bring in our entire IT team and make sure we had the facts,” Mills said. Even then, the afternoon statement was short on detail. Speaking Wednesday evening, Mills said the speculation in VanderWel’s message that some 777 production equipment might have gone down turned out not to be true. She added that the attack was limited to computers in the Commercial Airplanes division and that the military and services units were not affected. “To the best of our knowledge,” she said, the crisis is over and the attack did no significant damage. It was designed to lock users out of their data by encrypting files until they pay a fee, sometimes in cryptocurrency, or other type of ransom. Ransomware attacks have increased in recent years. The city of Atlanta experienced a five-day ransomware attack that was mostly fixed by Tuesday. However, Jake Williams, founder of cybersecurity consultancy Rendition Info­sec, said the ransomware part of the WannaCry virus is broken and there’s actually no way to pay a ransom that will retrieve files once encrypted. The sole purpose for a hacker to deploy it is to damage computer systems. The WannaCry virus first surfaced in a May 2017 worldwide cyberattack. Once a single computer is infected, it can spread to all Windows computers on a network. At the time, the Trump administration blamed North Korea for the attacks. Microsoft issued patches to plug the vulnerability. However, Corey Nachreiner, chief technology officer of Seattle security technology firm WatchGuard Technologies, said some companies with specialized equipment don’t update very often for fear their custom-built systems will be in danger. Microsoft declined to comment on the Boeing cyber­attack. Mitchell Edwards, a Dallas, Texas-based cyberthreat intelligence analyst, said that although a so-called “kill switch” fix for the WannaCry virus was quickly developed, other hackers were also quick to produce WannaCry variants that could defeat the fix. He said the virus used to attack Boeing could have been one of these updated WannaCry versions. Mounir Hahad, head of Juniper Threat Labs at Juniper Networks, said the infection could potentially have come from a dormant version of the original virus. He explained that the “kill switch” fix only works when a computer is connected to the internet. If the machine is rebooted when on a local network that’s not connected to the internet, the virus would resume the infection process. 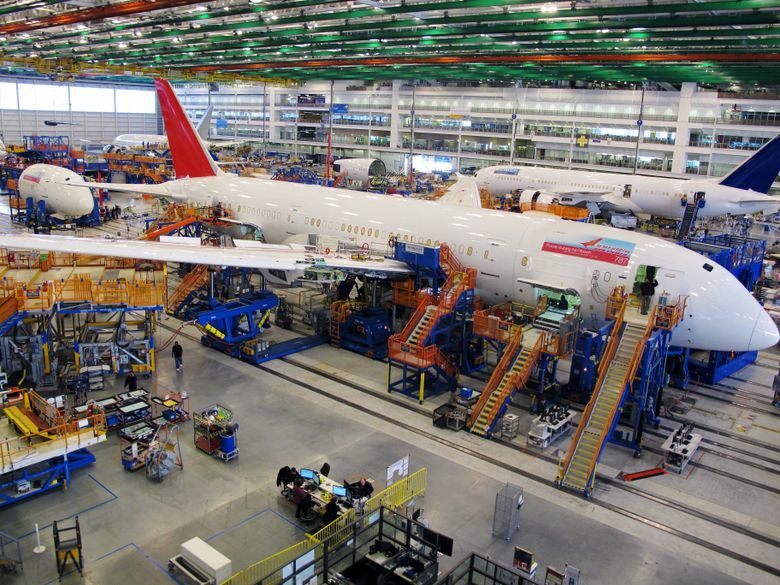 Whatever happened Wednesday with Boeing, the WannaCry threat to manufacturing businesses is real. Williams of Rendition Infosec said he knows of three manufacturing companies, two of them now his clients in the United States, that suffered production stoppages because of WannaCry infections in the last six months. He said one plant was down for 24 hours, another for 96 hours. In both cases, configuration files that controlled machines were lost and systems had to be reinstalled from scratch before production could restart. He declined to name the companies because of nondisclosure agreements. “Tons of manufacturing equipment runs on Windows. I was surprised,” Williams said. In addition, he said, some factory equipment runs on Windows Embedded, which is a variant of the operating system used in computer-controlled machines. An infection of the Windows Embedded machines “absolutely will bring down a plant,” he said. However, cyber experts judged one “nightmare scenario” that spread on social media Wednesday to be extremely unlikely. Once the Boeing cyberattack news broke, some on Twitter suggested the virus could perhaps infect an airplane’s control software and trigger a ransomware demand while in the air. Edwards dismissed this as “hysteria.” Williams agreed. In contrast, Williams said the threat to production systems is real, though solvable. His company has produced a free software fix called Tearstopper that he said prevents WannaCry viruses from encrypting files.